TalkTalk has been caught in the eye of a storm over its data protection and privacy policies and procedures leaving a wake of very angry customers threatening to take legal action for the breach of their personal data. 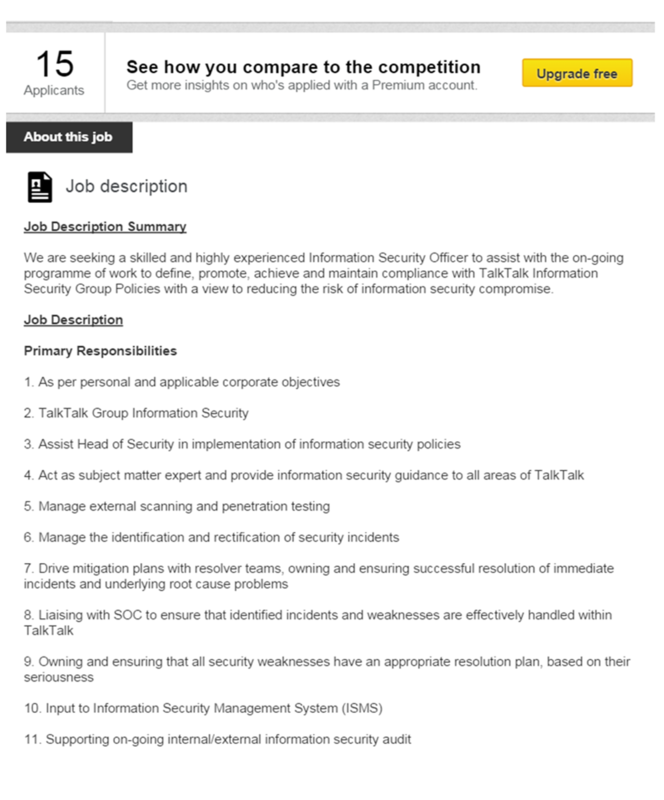 And as the Information Commissioner’s Officer (ICO) starts to investigate the mobile provider, it may like to read the advertisement TalkTalk placed on LinkedIn on the 19 October for the post of Information Security Officer. When we checked on Sunday 25 October, there had been 15 applicants for the post – now with the level of national media interest in how TalkTalk is culpable in its failure to adequately protect its customers, maybe there will be deluge of qualified candidates knocking on its door..? Or will it now have to pay a much bigger salary to attract the right calibre of person to do the job?